FAST Same Day response for North York residential / commercial customers! Intercity Heating and Cooling is and North York HVAC contractor who takes customer satisfaction seriously. As a trusted HVAC Contractor our technicians are trained and experienced - ready to offer residential and commercial customers the finest in air conditioning, heating and indoor air quality products and services. We understand that each customer situation is unique, and we recommend the ideal product solutions and services to ensure you are experiencing reliable and efficient indoor comfort year round. We install highly efficient air conditioners / heat pumps with R-410A refrigerant and high SEER ratings. 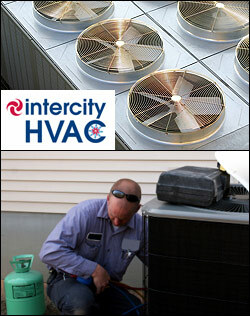 Intercity Heating and Cooling HVAC technicians have the experience required to do proper installations. We can evaluate your entire HVAC system - things like sealing. insulation and ductwork - to ensure you are obtaining maximum efficiency from your indoor comfort system. During the frigid winter months, Intercity Heating and Cooling is here to ensure that you are kept warm and comfortable. Our technicians can service / repair any brand of furnace (or heat pump), and we offer superior new products with high efficiency ratings (AFUE) that can help substantially lower your utility bills! We want to help you avoid events like a dead air conditioner in the middle of July by taking advantage of our quarterly maintenance services. Your heating and air conditioning system is just like your automobile - neglect leads to decreased performance, efficiency and reliability. Intercity Heating and Cooling quarterly maintenance service will keep your system running like it is supposed to which means lower utility bills, fewer problems and longer system life! True cooks understand the benefits of a gas line stove. You obtain much better control of your heating than you can with an electric stove. Intercity Heating and Cooling specializes in prepping your home for the installation of a gas line stove which will bring you finer cooking control! Get a FREE estimate from a trusted HVAC Contractor! Do you have an existing residential or commercial HVAC system that is not giving efficient performance or is in need of repair/replacement? We will come evaluate your HVAC system free of charge and show you best options for efficient, reliable heating and cooling!